Copier Bevelmachines is happy to introduce its latest machine development for metal pipe cutting and bevelling in one production line: the Beaver CB series. It is available in several sizes, overall from 1 - 48 in. Copier Bevelmachines has been a manufacturer of pipe end working machinery for many years now. The company offers stationary equipment for pipe shops, mainly pipe bevelling machines, pipe cut and bevelling machines, CNC pipe end working machines and pipe spool welding machines. Since all its customers have to cut or saw the pipes before they start beveling, Copier Bevelmachines developed a production line capable of cutting and bevelling metal pipes. This machine is called the Beaver CB. To have these features in one machine is very efficient and effective. The Beaver CB is modular built. You can have the basic cut and bevelling machine, but you can expand with several types of roller benches, with manual or automatic pipe handling. Also, length measuring is possible: it makes it very easy to cut a pipe to several different lengths. One operator could control the complete production line from the operator panel. You also can connect it to the overall shop control system and send the orders to the machine. With the Beaver CB series, the output will be higher because length measuring, cutting and bevelling is combined in one machine. The Beaver CB is a completely CNC-controlled machine with both radial and axial feeding. It cuts with up to three cutting bits from outside to inside of the pipe and, during this process, it performs a bevel shape with the required angles. All ASME code bevels are pre-set in the machine. The operator could select one of the pre-set bevel shapes and dimensions that have been saved in the software of the CNC programme. These bevel shapes are mostly based on the ASME or DIN bevel shapes and dimensions. The machine automatically changes tools according to the bevel shape and angles. The machine works with a single point CNC machining process and because of that could cut and bevel up to 60 mm thick walls. The Beaver CB will perform a bevel shape on both ends of the cut pipe if required. On the front infeed conveyor you put a metal pipe. The operator fills in the pipe parameters such as pipe diameter, wall thickness, type of steel, bevel type and pipe length. The operator also enters all the lengths of the pipe parts that needs to be cut from the starting length. The push up infeed conveyor pushes the pipe into the Beaver CB and knows where to clamp it in order to make the cut on the required length as entered in the programme. The machine starts cutting and during the cutting process it performs a bevel on both pipe ends. After that the pipe pieces are processed to the outfeed conveyor from where they can be dispatched. The Beaver CB is a user-friendly machine mainly because everything is straight forward in the CNC programme that Copier Bevelmachines designed with the company, FANUC. The machine operator works in an operator level and cannot change settings if not allowed. Only the administrator can change programme settings. To work with this machine, you do not have to be a trained CNC machining expert but you have to understand the basic process of course the CNC programme. Obviously the output of the Beaver CB is much higher that when you would invest in a band saw in combination with bevelling machines. Another advantage is that you do not have the internal transport anymore from the saw to the bevelling machine. Another advantage of the Beaver CB series is the exact 90°cut it makes. The Beaver CB is flexible and suitable for many pipe fabrication jobs because the most common bevel shapes and bevel angles are pre-set in the CNC software of the machine. Besides that, the machine automatically performs these shapes by single point machining. You can do all different types of bevel shapes without changing tools. Also, the full machining range can be done without adjusting the tool position. 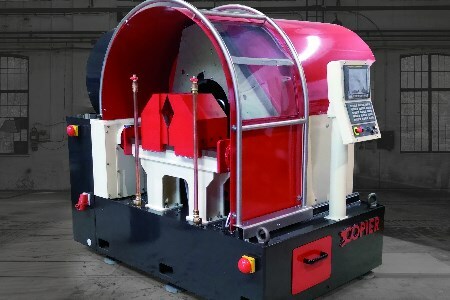 Altogether, it is a high quality machine that can increase the output and the flexibility of ones pipe shop. Copier Bevelmachines will demonstrate the Beaver CB at the Schweissen und Schneiden exhibition in Dusseldorf, Germany this year, at its stand number 10B04.